Wash your hands often with soap and clean water - and use clean towels to dry them. This can be difficult in slum and rural areas where there is not always direct access to clean water - but it is an effective way to kill the virus. Ordinary soap is all that's needed. Shaking hands should also generally be avoided, Dr Unni Krishnan of Plan International told BBC Africa, because Ebola spreads quickly when people come into contact with an infected person's body fluids and symptoms can take a while to show. Other forms of greeting are being encouraged, he says. So if you suspect someone of having Ebola, do not touch them. This may seem cruel when you see a loved one in pain and you want to hug and nurse them, but body fluids - urine and stools, vomit, blood, nasal mucus, saliva, tears, sperm and vaginal secretion - can all pass on the virus. An infected person's symptoms include fever, muscle and joint pain, sore throat, headache and fatigue - followed by nausea, vomiting and diarrhoea, which may include blood. Encourage them to seek help from a medical professional or health centre as soon as possible. It is also advisable not to touch the clothes or bedclothes of Ebola patients - and Medecins Sans Frontieres advises that such sheets and even mattresses be burnt. If you think someone has died from Ebola, do not touch their body, even as part of a burial ceremony. When someone has died, you can still catch Ebola from their body as it ejects fluids that make it even more contagious than that of a sick person. Organise for a specialised team to deal with the body as quickly as possible as it is risky to leave a dead body for any length of time in a cramped living area. Avoid hunting, touching and eating bushmeat such as bats, monkeys and chimpanzees, as scientists believe this is how the virus was first transmitted to humans. Even if a certain wild animal is a delicacy in your region, avoid it as its meat or blood may be contaminated. Make sure all food is cooked properly. Spreading rumours increases fear. Do not be scared of health workers - they are there to help and a clinic is the best place for a person to recover - they will be rehydrated and receive pain relief. About half of the people infected in the current outbreak have died. There have been cases of medics being attacked and people being abandoned when they are suspected of having Ebola - even when they are suffering from something else. A belief in irrational traditional remedies has also exacerbated the spread of the virus. "Prevention is the best way to deal with Ebola, so stop rumours and do not panic; it is possible to reduce the suffering and save lives," Dr Krishnan says. 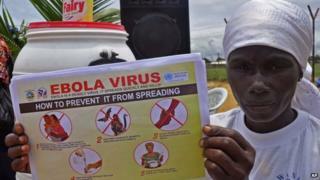 For more updates on Ebola, you down a BBC podcast issued twice a week on the latest health advice about the virus.